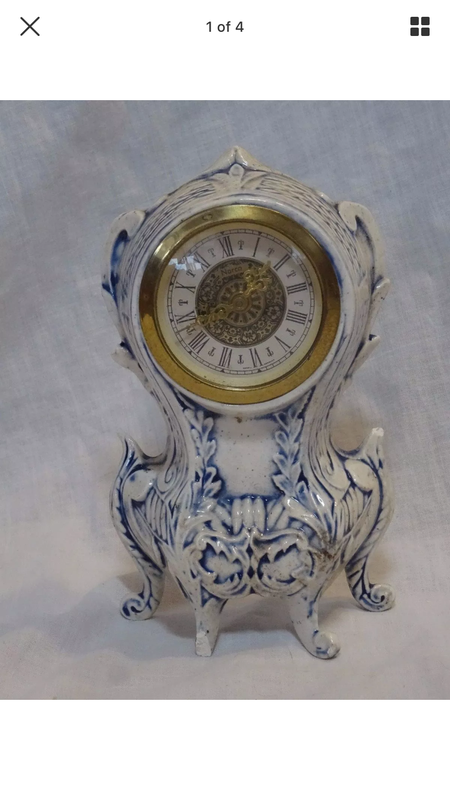 Antiques, Clock Repair, German Antiques, Knock offs of antiques - are they still antiques? 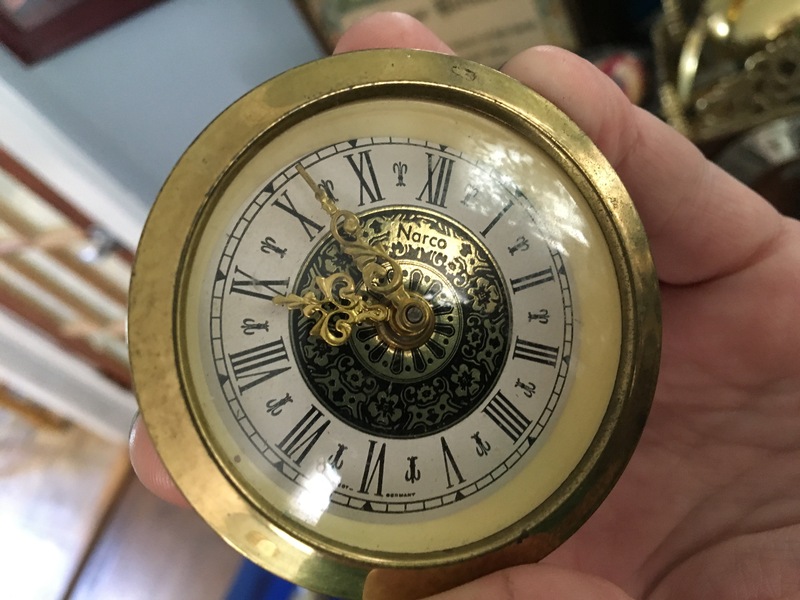 So I bought a clock with a movement labeled Narco on eBay for $5.00 + $9.46 for shipping. The clock wasn’t working but it looked pretty and said it was from Germany and at this point it’s all practice. Well around the same time I also purchased a small similar looking movement labeled Minxie without a case, for $16.50 and free shipping. Okay so there are a lot of similarities between the Minxie and Narco clocks. They are the same size and shape and have exactly the same hands. I THINK (THINK) that the Narco is a knock off of the Minxie. The Minxie says Made in Germany. The other says Narco on the face but then when you take off the back plate it says Mercedes, Gebr Hauser. I need to look at the clock again but I guess it is from the 1950s or so. It says West Germany on the back. Gebr Hauser went through various names through the 1920s-1950s, so I should identify by the exactly writing what incarnation of Gebr Hauser this was and that’ll date the movement. Why does it say Narco? Not a clue. Maybe that’s just the dial. A lot of German and West German clock companies used the name Mercedes here and there as a marketing tool so that doesn’t tell me anything. Took both apart. Narco (as I will call it) doesn’t keep running, and always stops when I tilt it backwards meaning one of the gears is probably falling out of alignment. Both clocks use balance wheel escapements. When I took the Narco apart, the thin wire of the balance wheel got kind of tangled. I hope I don’t have to take the Minxie apart because it seems to be running fine. It came without a case, but online I found a picture of a Minxie in the case I got the Narco in! I bet someone switched it. Okay so it’s probably worth next to nothing because of the three cracked spots. But that’s okay! Because I have learned a valuable lesson, or two or three. For one, $5 really was the right value of this clock (while broken, with the replacement Narco movement). 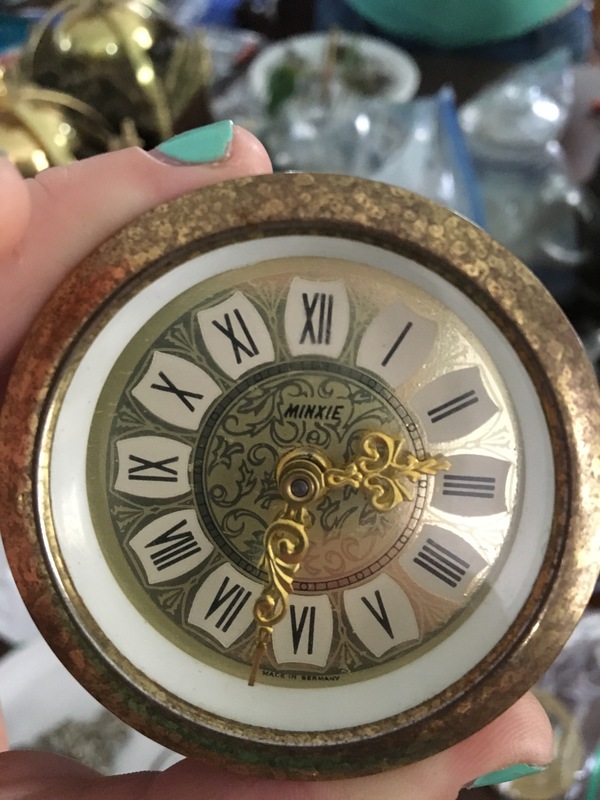 If I verify that the Minxie movement is A-Okay (it just needed a little TLC) and put it in the porcelain case then I have an original, but it’s not in pristine condition. 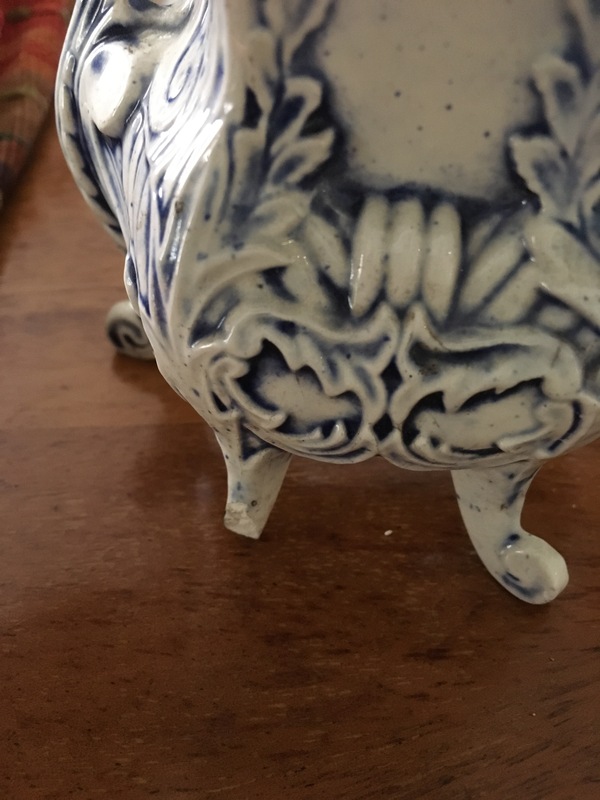 If I want to sell either of these for money I think my best bet is to buy an empty German porcelain case from the 1930s or 40s and put the Minxie in that. But I’m not sure if I’ll try to sell it at all. It’s cute and I like it! I also got to play with balance wheel escapements. I can see the appeal but I’m not sure if I prefer it over a pendulum. Expect a post soon comparing and contrasting different types of escapements. Bye for now! Worked on the Minxie tonight and checked the time on it enough to be reasonably sure that it’s working well. My opinion that the Narco is a knock-off has been strengthened by the two plastic gears used inside the Narco. Cleaned it off a bit (that Brasso, gotta love it) and put it inside the porcelain that I got the Narco in. It’s a 97% perfect fit and I’m going to blame that last 3% on the porcelain not being perfectly circular. Uhren means clocks or watches in German and Jura is a branch of the Western Alps that goes through Germany. JURA-UHREN likely denotes that the clock is a product of that locale, which has been known for its watch- and clockmaking for centuries. You learn something new every day! Coming soon: a blog post about escapements that I’ve started, and a blog on the (newest) love of my life, a small Ansonia wall clock that I’ve been playing with the last few days. UPDATE 8/19: Minxie still running on time.